With his neat goatee, his slight shoulders, his baggy, grey wool suit and his Pince-nez, Professor Propp was every bit the archetype of the absorbed, absent-minded academic that he was. Ambling through archive and classifying old stories told by peasants on the dusty, ashen steppe, Vladimir Propp compiled a rigorous, analytical compendium of the themes threaded through Russian folklore, and ultimately, he hoped a key to not just legends everywhere, but indeed to the very stuff of narrative as it ever was, or ever could be. Born in St. Petersburg when it was still St. Petersburg, and then Petrograd, and then Leningrad, but before it would be St. Petersburg again, Propp contemplated Vasilisa the Beautiful, Emelya the Simpleton, and the Frog Princess from the beginnings of his education during the last days of Czar Nicholas II, and through the reigns of Lenin, Stalin, Malenkov, Khrushchev, and Brezhnev. The result, though his career can’t be reduced to his most famous volume, was the immaculate, under-read, idiosyncratic 1928 Morphology of the Folktale. A mainstay of folklore studies, Propp’s approach was indicative of his colleagues in the literary-critical methodology which is variously termed “Russian Formalism” or “The Prague School,” in honor of the ultimate destination of so-many of them exiled after the Revolution. What Propp presents in Morphology of the Folktale is a strange, almost mathematical schema to supposedly classify and analyze the deep structure of any possible legend, a sort of real-world example of Dr. Casaubon’s Key to all Mythologies from George Elliot’s Middlemarch. Propp writes in an arid, technical prose that matches the scientific rigor of the linguist he was more than the flights of philosophical fancy associated with western literary criticism, with sober sentences (chosen at random to give the reader a sense) like “Definition of a function will most often be given in the form of a noun expressing an action (interdiction, interrogation, flight, etc.). Secondly, an action cannot be defined apart from its place in the course of narration. The meaning which a given function has in the course of action must be considered,” and so on. γ1 β1 δ1 A1 C ↑ [D ¬E1 ¬F]3 d7 E7 F9 = G4 K1 ↓ [Pr1 D1 E1 F9 = Rs4]3. As a critical method, it’s strange, but not without its uses. Chief among his perceptive observations is the identification of a narrative rule so basic and implicit in our cognitive perspective that we scarcely notice it, a principle which readers of Propp have called “The Rule of Three.” In Morphology of the Folktale, Propp terms this trope “trebling,” writing that the grouping of characters, elements, or events can “occur among individual details of an attributive nature (the three heads of a dragon), as well as among individual functions, pairs of functions (pursuit-rescue), groups of functions, and entire moves.” He explains that such repetition “may appear as a uniform distribution (three task, three years’ service) as an accumulation (the third task is the most difficult, the third battle the worst), or may produce negative results before the third, successful outcome.” In a word, the number three tends to appear with some regularity throughout folktales, Russian or not. Think of Goldilocks’ three bears, Rumpelstiltskin’s three spinnings, or Snow White’s three visits with the wicked stepmother. Propp proffers no explanation for the ubiquity of the number throughout folktales, but a consideration of not just myth, but religion, literature, rhetoric, even comedy demonstrates that three is replete across human expression. 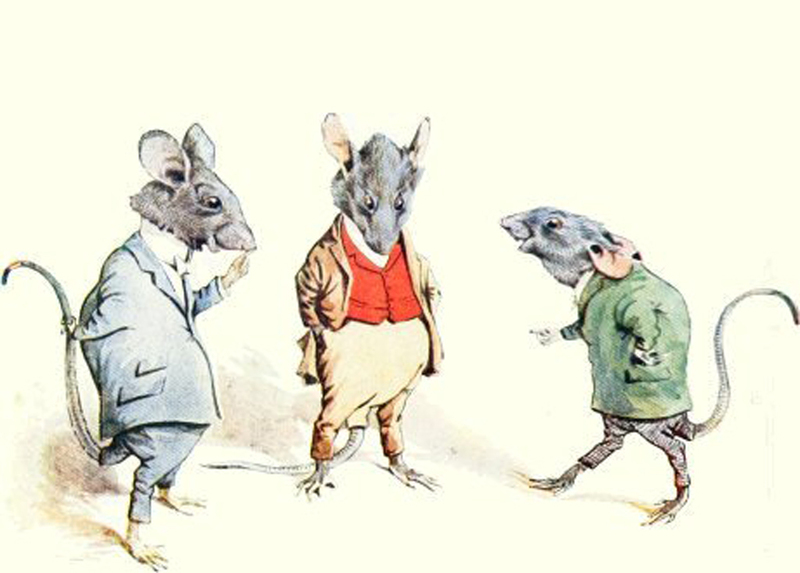 Everywhere in fairy tales and nursery rhymes, for there are three little pigs, three Billy goats’ gruff, three French hens, and three blind mice. Propp’s rule of three mandates how narratives naturally divide into the three of not just beginning, middle, and end, but indeed how what rhetoricians call the “tricolon” mandates the structure of everything from some individual turns of phrase to jokes. Our minds in some sense expect things to come in threes, consider how Winston Churchill’s phrase “blood, sweat, toil, and tears” from his celebrated 1940 speech before the House of Commons is so often consciously corrected in peoples’ minds to simply “blood, sweat, and tears,” the abstract concept having been subtracted from the more visceral imagery, which conveniently results in a more cognitively pleasing tricolon. Three in some sense seems baked into the very contours of reality; though the present always is but an ephemeral thing, it still separates the past from the future while dividing time into a tripartite. Many languages posit three broad tenses separating the ‘I” from the “You” from the “They.” And the very dimensions of space which define our existence as embodied creatures constrained by the laws of physics are reducible to height, width, and breadth. Various combinations of deities are organized into over two dozen different permutations of divine triads in classical Greek polytheism, as well as in Roman religion (all goddesses it should be pointed out), with the suppressed Greek magical papyri of the century before Christ’s birth referring to Hecate, Persephone, and Selene as “”triple-sounding, triple-headed, triple-voiced…, triple-pointed, triple-faced, triple-necked,” and there are similar triads found in unrelated traditions as varied as the ancient Irish to Yoruba. There are the three chief goddesses of pre-Islamic Arabic polytheism: al-Lat, Al-Uzza, and Manat. Egyptian polytheism recognized the “Theban Triad” of Amen, Mut, and Khons, as well as the more famous triumvirate of the resurrected green-skinned Osiris, his wife Isis, and their swaddled son falcon-beaked Horus. The Greeks had their Zeus, Athena, and Apollo; the Romans had Jupiter, Juno, and Minerva; the Teutons Odin, Freyr, and Thor. More recently, whether actual ancient belief, or syncretic neo-Paganism, Wicca recognizes the three functions of their female deity in Maiden, Mother, and Crone. Chief among such triads is Hinduism’s Trimurti, for that diverse combination of practices and beliefs based in the Vedic and dharmic traditions that emerged in the Indus River Valley conceives of the Godhead as divisible into austere Brahma, limber Vishnu, and chaotic Shiva who each respectively function as creator, sustainer, and destroyer – which is in itself a good tripartite breakdown of the basic functions of individual existence. Sometime appropriately in the third century the Christian Church Father Tertullian coined the term “Trinity,” describing it as being “tres personae, una substantia” to refer to the three persons of one substance whom constitute the concept. And Athanasius of Alexandria wrote in his famous (tripartite organized) creed of the fourth century that “we worship one God in Trinity, and Trinity in Unity; neither confounding the Persons, nor dividing the Essence,” but as enumerated he was anticipated by countless traditions before. Presented with the sheer multitude of examples of divine triads across culture and religion, there tend to be two major reactions. Firstly, the cynic will see such a corpus as evidence of Christianity’s unoriginality (as if the goal of truth must always be novelty). Whether claiming direct syncretic plagiarism between traditions (and while he was aware of Mithraism, it seems hard to believe that Tertullian was intimately familiar with Yoruba cosmology as well), or that the multiplicity alone condemns Christianity (or any faith’s) claims to singularity, the skeptic sees such an abundance as indicating a grave embarrassment. The occultist on the other hand reads the exact same evidence as proving some sort of inherent truth to Trinitarian thought, whether Christian or otherwise. They understand such repetitions, such grand trebling, as deep-seated, inherent proof of the concept’s basic legitimacy. Some Christians, from the patrists to the typologists of the Reformation, saw these precursors as evidence of the concept’s inherent truth. For these thinkers, trebling across archaic cults evidenced that the trinitarian concept was deeply imbedded in the individual soul, the details being made murky by sin and Satan, but the fundamental yearning toward the tripartite Godhead still implicit within our being. A mark of what Dionysius, the third century Bishop of Alexandria, described as the “indivisible Unity into a Trinity; and again, we contract the Trinity, which cannot be diminished, into a Unity.” The French philologist Georges Dumézil in his “trifunctional hypothesis” ascribed the omnipresence of the number to the archaic means of structuring ancient Indo-European societies, yet that ignores the multitude of examples in cultures and languages far from the traditional confines of the Indo-European. Perhaps this perennial tendency to trebling can be cognitively explained. After all, among anumeric languages, such as the indigenous tongue of the Pirahã from the Brazilian Amazon, there are normally always words for the first three numbers, leaving the equivalent of “many” for anything that goes beyond. Significantly it would seem that the number three is the largest that the human mind can comprehend in its totality before needing to actually keep track. The first three numbers implicit before we even needed to invent mathematics. Even if you’re one of the smug skeptics who gladly points out previous examples to prove Christianity’s supposed lack of originality, one must admit that the faith presents a particularly complex mechanism for how a Trinity can operate within monotheism. The strictures of the Athanasian Creed, the writings of early Church Fathers like Tertullian, the scores of treatises and tomes written to explicate the complexities of the concept speak to a degree of philosophical sophistication. I’ve admittedly sometimes engaged the worst reductionisms of classic comparative mythology which is content to trade God the Father in for Brahma, Vishnu for Christ (and incarnated Krishna for incarnated Jesus), and Shiva for the Holy Spirit. Such approaches, from James Frazier to Carl Jung to Northrop Frye to especially Joseph Campbell do a sort of violence to traditions by simplifying them together in the elimination of difference. Which is why it’s important not to focus on the deity but the number itself, to ignore God in favor of Three, to engage with the glorious inconsistencies, divine paradoxes, and sublime contradictions of that number. As a general rule, Christian heresy is normally that which avoids paradox; Arianism being a (excuse the pun) prime example. With little biblical justification, save for the forged interpolation of John 5:7 known as the “Comma Johanneum,” which read “there are three that bear record in heaven” and whose authenticity was debunked by Erasmus in the sixteenth century. But the idea that we must only adhere to that with scriptural precedent is its own type of rectilinear, positivist, rationalist heresy, better to fully embrace the strangeness of Trinitarian thought regardless of biblical recourse (or even whether we literally believe it ourselves). Conversation with most Christians will disavow us in thinking that very many people actually believe in the Trinity, much less understand it, especially its complex Neo-Platonist justifications. I’m aware that the last few paragraphs read as a defense of Trinitarian Christology, if not orthodox in deployment, then certainly so in sentiment. It is easy to read my argument as some kind of apology for one of the most foundational tenants of normative Christianity. If that’s your reading, so be it; it’s not my intent that a few modest words convince you of the efficacy of a Trinitarian metaphysic, but if that’s the result then I’m not upset either. As concerns my own pose towards the question, I no more literally believe in the Trinity than I do the radical unity of God, preferring whether to borrow liberally from both beliefs as I see fit, content with the fundamental contradiction of such a position. When it comes to literal belief I’m not sure what such a thing even means or looks like, much less how an individual believer would live it. That, it would seem, is the subject for another essay. Rather, what I’ll say is that there is room enough and more for the radical unity of God in the Jewish Shema or Islamic Tawhid; for the binary oppositions of Zoroastrian and Manichean duality; and for the crowded Trinity of Christianity or Trimurti of Hinduism. Fundamentally, what the number one represents is the single mind in repose, two embodies minds in dialogue, and the number three is the smallest number at which a multitude is possible. Numerology is hardly a respectable discipline, and yet an awareness of the poetic potential in numbers is too often occluded in our readings of literature. What would it mean to interpret mathematics as literature itself? I’m not speaking merely of reading instances of numbers in poetry – looking at repetitions of three in Dante’s Divine Comedy, or whatever – but actually reading numbers and equations as narrative which have as much to express about human meaning as does more traditional communication? After all, mathematics is simply another language, to paraphrase Galileo. Mathematics is a language that is completely true, and yet totally not real – that’s its definition. It’s a sort of Absolute Zero of human communication; imagine how fruitful a hermeneutic of interpreting math as literature could be? Just as good to remember that narrative and poetic literature is simply the mathematics of consciousness. Ed Simon is the Editor-at-Large for The Marginalia Review of Books a channel of The Los Angeles Review of Books. His writing regularly appears at sites like The Atlantic, The Paris Review Daily, The Washington Post, Newsweek, Salon, LitHub, The Millions, and several others. His collection America and Other Fictions: On Radical Faith and Post-Religion will be released by Zero Books later this year. He can be followed on Twitter @WithEdSimon, or at his website.